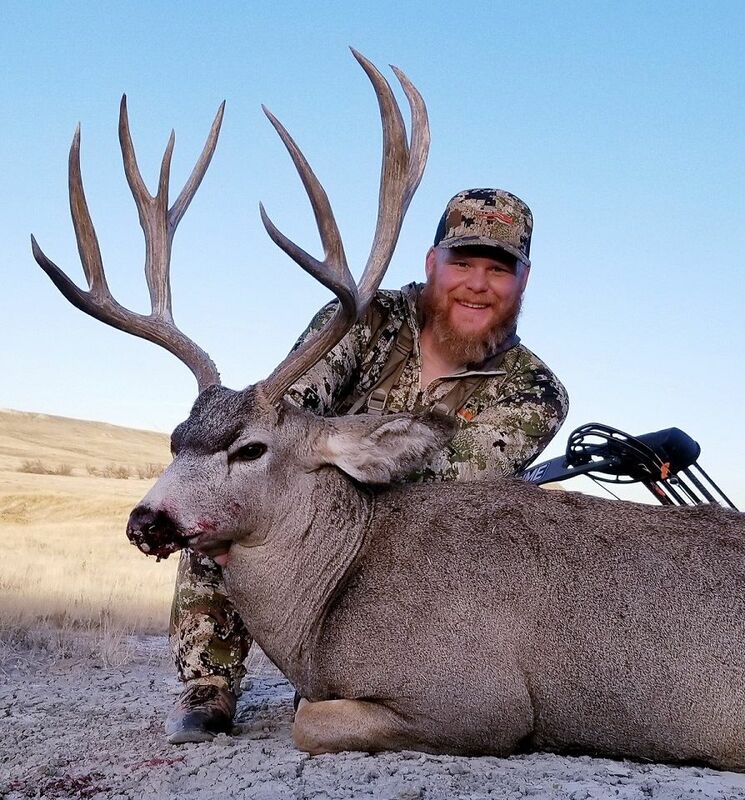 My second planned hunt for the year was an archery deer tag in western South Dakota. I have been hunting a stretch of ground in the middle of the state for several years now. After 3 years of working this unit out I felt we had a good shot for success this time. I like to do this hunt starting around the 15th of October for two reasons. One, It’s the opening weekend of pheasant season and nobody is deer hunting. Two, The bucks during this week are breaking up into smaller bunches or going off on their own to bed and are easier to sneak because you don’t have as many deer in each bunch to bust you. So on the 14th Tyler and I shut the shop down and headed out to meet my Brother, Dad and another friend Ben for 5 days of hunting deer. As it turned out Sam would get the ball rolling on this trip and shot a buck the morning of the day we departed. Ben spotted the buck Sam ended up getting initially on private land and it feed into the public ground we were hunting to find a shady spot to spend the warm 70+ degree day that he had to work with. 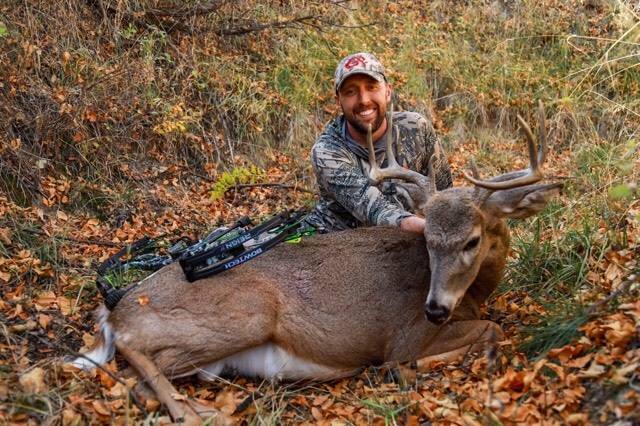 Sam was able to sneak within bow range and get this buck in his bed. After a short distance the deer piled up and Sam’s hunt concluded. 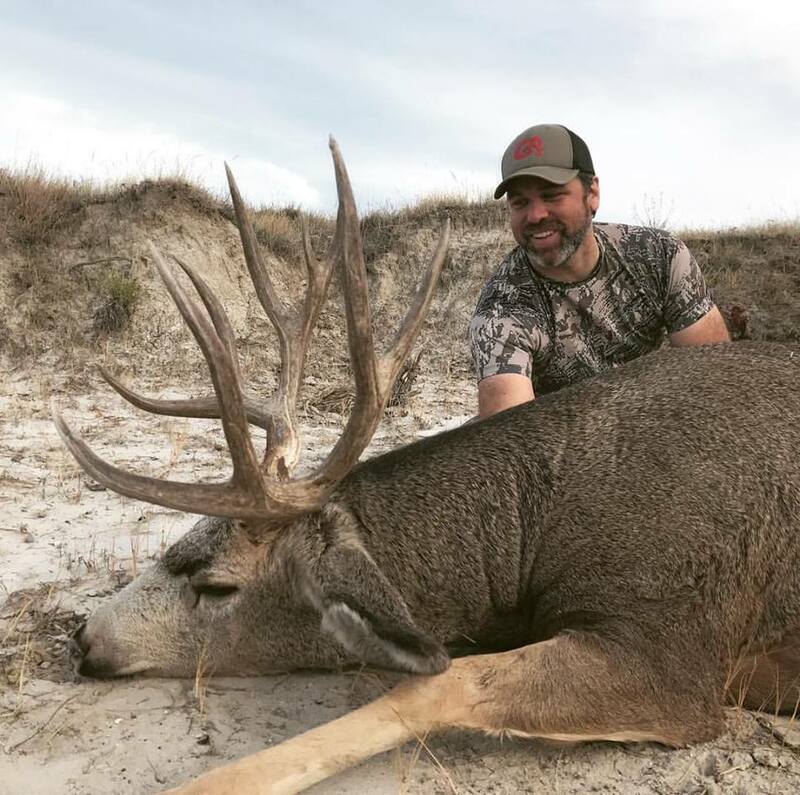 This buck represented a lot of time invested. 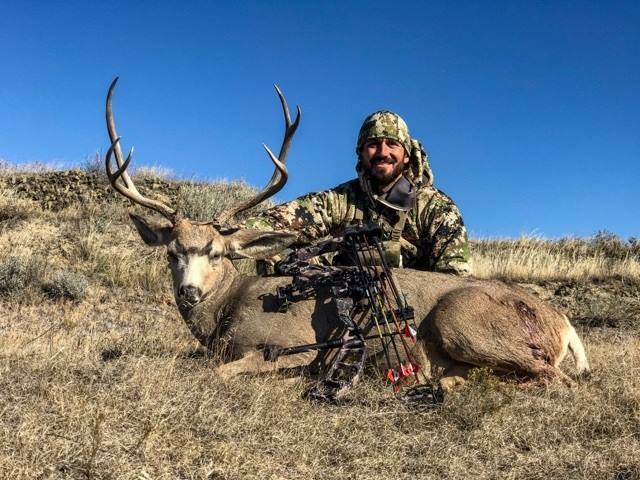 Sam had spent a ton of time in this area before taking this Muley. 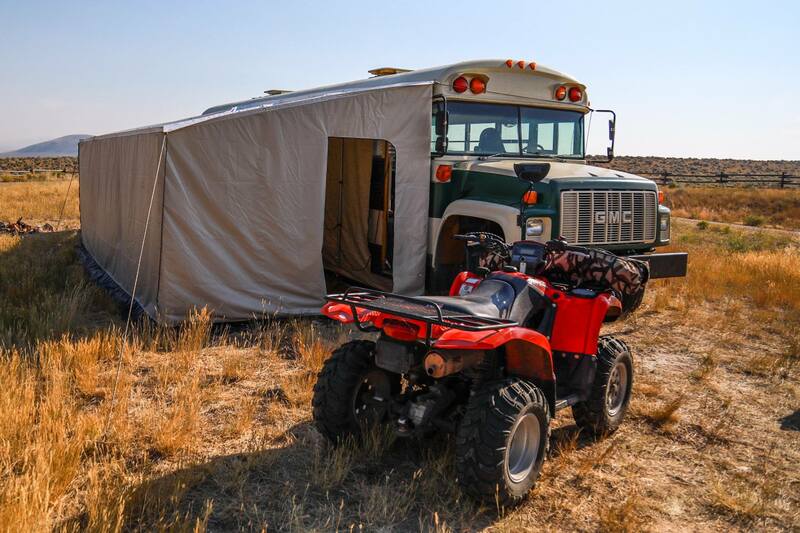 Tyler and I arrived about midnight and crept into the bus that my brother turned into a mobile hunting camp and grabbed a few hours of sleep before we got after it. That morning we decided to head to a large block of public ground we had not looked at before. As it turned out this piece had been grazed down to golf course status and was essentially devoid of deer. After letting the prime time of the morning hunt slip out of reach, Tyler an I blasted about 20 miles to another spot we thought looked promising parked hiked in about a ½ mile and set up to glass starting at 10:00 AM. Surprisingly within about 5 minutes we located a really big Typical 5X about 2 miles away down this drainage we were checking out. He looked as if he had been bumped more than likely by pheasant hunters some distance from where we put eyes on him and he slowly poked along for about another 200 yards found some shade and bedded down. Tyler won the coin toss and headed in for the first sneak. I back and looked for other bucks in all the little shade pockets that I could put my eyes on and turned up nothing but a few does. 30 minutes later I spotted Tyler climbing over the last cut bank that put him about 100 yards across a plateau from the creek where the deer was bedded. I settled in behind the glass to watch the tension unfold. This deer was on edge the whole time we were around him and as Tyler approached on a belly crawl the buck scanned diligently unaware of his presence but just plain twitchy. As Tyler got well within bow range he shifted him bow in position to shoot and the buck must have caught his cam as he rotated up the buck was instantly on his feet staring in Tyler’s direction as he came to full draw the buck wheeled and blew up this hill away from him and then came to an abrupt stop. Tyler turned and arrow loose. Unfortunately the arrow fell short and missed the deer low. Neither one of us had a clear picture on how large of a buck this was until he was on his way out. It is an image neither one of us will forget. That huge frame clearing the ridge…He was a good deer… We did not haul meat that hunt but not too shabby for a last ditch effort on morning one. We returned to camp to hear that my Dad had also missed a buck that morning and he and my brother laughed about the bungled scenario they had got themselves into with multiple bucks in a bachelor herd just not quite making the right moves for them to close. Ben had spotted a great Mule Deer buck and had put him to bed and as we returned he was back out in the field making his long approach and wait on a deer that he had a sight adjustment problem with and ended up missing that buck twice, ending our day one with 3 missed deer… A very strange occurrence for this crew to not close on 4 shots on three deer but apparently everything is possible. 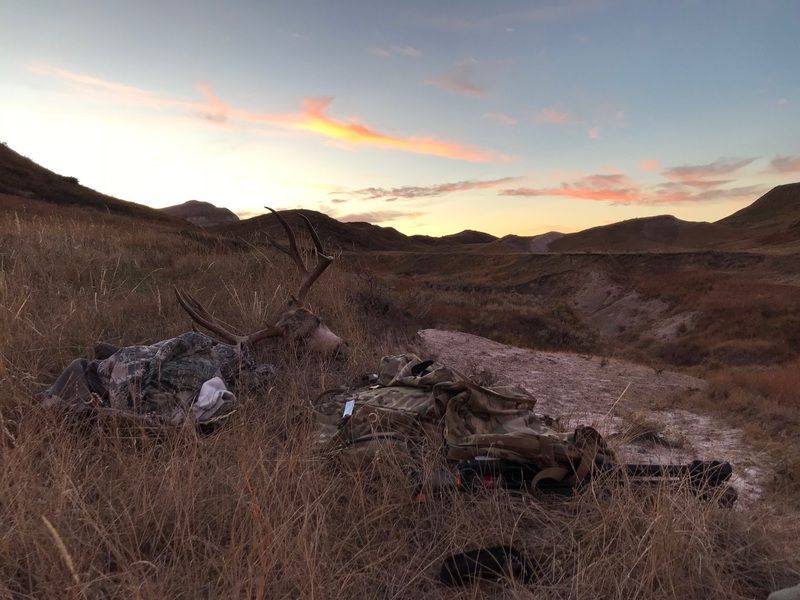 This had been a combination of the best and worst day of Mule deer hunting we have collectively had. We ended day one with frustration but also excitement knowing what 4 years of work hunting and learning this area was more than likely going to produce as the week went on. The second day of the hunt we split up into groups once again. Sam and my Dad headed East Tyler and I headed south and Ben to the west to try to bed another buck down in the same spot as the day before. As it turned out Ben did find a different deer that chose the same spot to bed as the buck that eluded him only a day ago. He ran the same play sneaking into 40 yards and sitting for 5 hours in the hot sun waiting for the buck to get up to feed for the evening. The deer finally stood up at about 5PM and Ben shot him perfectly and punched his tag with a really impressive tall heavy Mule Deer. We all felt very positive on the continued success we were finding on this trip. We had struggled here so much in the past it was a refreshing change to feel that we had the place somewhat dialed in. The following morning Ben and my Dad had to get going. This left Tyler, Sam who was done and me to try to dig two more deer out of this endless prairie location. Day three was the hottest one yet, highs were to be in the low 80’s and the only plan we had that day was to focus on shade and water. We decided to work drainage in the area and basically poke along glassing as many shade pockets as we could get our eyes on. As it turned out that was about 5 shady places…After which Tyler poked his head over the cut bank and spotted 3 whitetail bucks lazing the hot day away at only 18 yards from him! He immediately drew and fired and all hell broke loose with the other two bucks breaking in opposite directions which blew a few groups of does out as well. After a lunch break in the shade we tracked Tyler’s deer found him and short order and got it hauled out and in a cooler. Day three belonged to Tyler with a nice and unexpected Whitetail Buck. The fourth and final day of the hunt we heading to the north of camp into some breaks that we had found some deer earlier in the trip. The three of us broke up and took multiple views to try to find a deer for me to chase that day. At around 8:30 Sam put his eyes on a deer through the spotter that through the thermals he could only see as having big body and big frame. He say the deer for about 30 seconds as he and another smaller buck moved down a light colored hill into a shady hole that we figured they would spend the day. With that being the only what we figured to be mature deer we spotted. I decided to take a swing at him that evening. When we arrived I shed an unneeded gear and put on my felt sneaky feet and attached a heads up mule deer doe decoy to the bow mount on my bow. My plan was to basically walk in like I owned the place, range the buck from the cover of the decoy and the setting sun pull and take my shot. As I poked over the edge, I instantly spotted the buck the bruiser was running with I took a range on him to give myself a reference and kept creeping forward looking for the bigger buck. As it turned out he was about 125 yards from me staring at me obviously thinking I was a doe because he didn’t blow out. I backed off down the hill again and took off running behind the hill to get myself more in line with where he was. Once I was parallel to him I climbed back over the hill found him again took a range, leaned back drew, leaned forward and shot. The arrow hit hard and the buck charged off head down looking hurt. He and the younger deer cleared one more little ridge away from me after the shot and I made my way to the top of it to see if I could see him. As I crested the hill I saw the younger buck standing there staring back at the creek bed I let my gaze follow his and it led me to see him dead in the bottom of the wash. It had worked! I sat there in that moment honestly surprised it had come together. I knew he was the biggest buck I had taken and to do it in that way added so much to the value of this hunt to me. I cannot believe how valuable that decoy had been in allowing me the time and fudge room in what ended up being a 7 ½ year old mule deer stock. What a hunt! Tyler and I broke this deer down and began the long satisfying pack and ride back to the truck. It was a beautiful night on the prairie and in the darkness and labor of the haul out I felt like I was where I was supposed to be in the universe, amongst family and dear friends doing what we do best. I will not soon forget how great of a week this hunt proved to be.